It’s been a mild prelude to winter here, but this weekend the weather finally got cold and even gave us a dusting of snow. This has activated my soup gene, which often lies dormant for months at a time. When I thought about making a soup, I decided there were three things I wanted: meatballs, pasta, and beans. 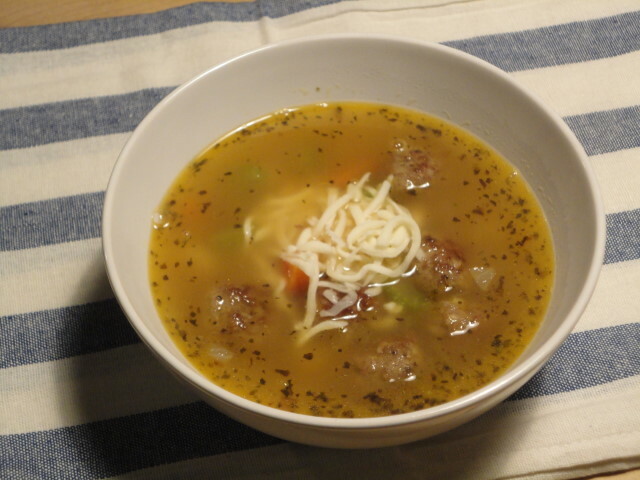 Now, some people might think that this is Italian Wedding Soup, but I don’t think so. I have no idea, though; I’m Irish and single. First, go cook your pasta. I used “large elbows” for something different, but regular egg noodles would probably have been better. However, I’ve never been one to quibble over pasta shapes. Next, we’ll make the meatballs. I think this is a pretty standard meatball recipe, so you could use it to make meatballs for pasta or whatever you like. 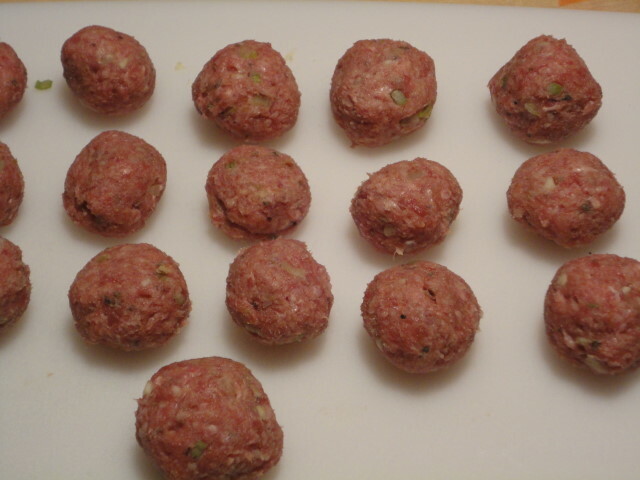 Be sure to shop your garlic and onion very small so they fit inside the meatballs. 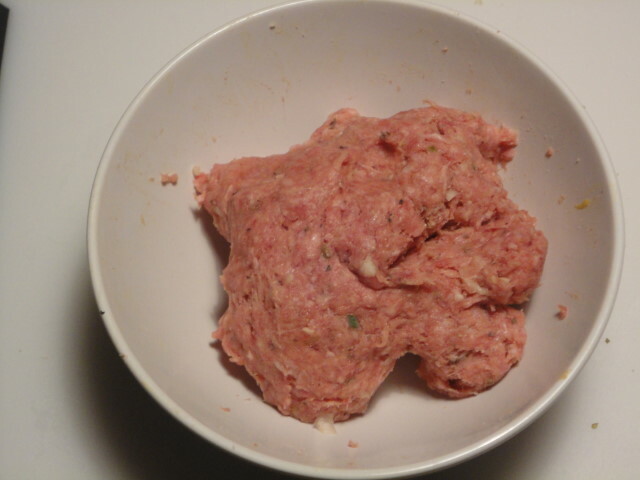 Then place all of the meatball ingredients above into a bowl and mix them together well. You can use a food processor, if you like, but I’m from the School Of Using your Hands. It’ll get messy, but in the end you should have something that looks like raw meatballs. No sense in washing your hands just yet–it’s meatball-shaping time! I hope that you all learned how to make round balls with play-doh when you were young. If not, go yell at your parents. I’ll wait. When you get back, just pull off a blob of meat and roll it between your palms (or on the counter). 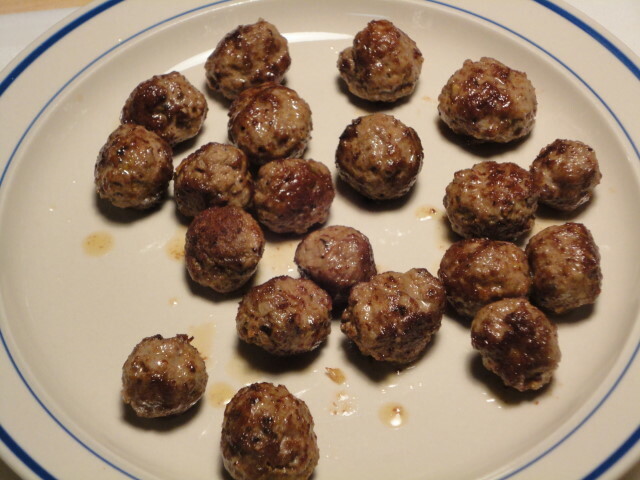 I was going for tiny little meatballs, so mine were about 3/4 of an inch wide. I think that next time I’ll go smaller, but they were fine. I was able to make about 20 meatballs. Now set them aside for a moment and get the rest of the ingredients ready. 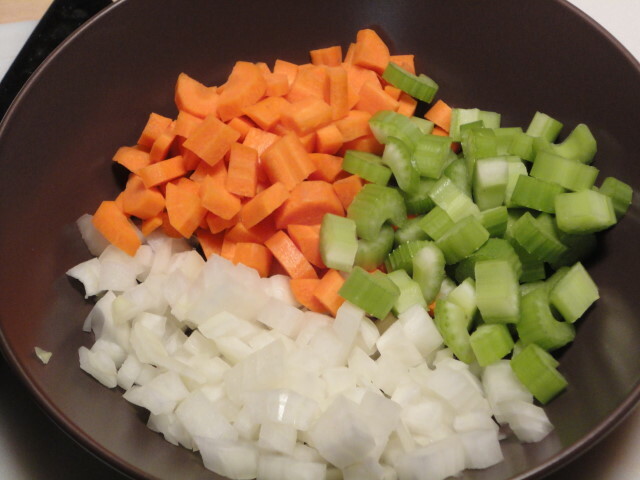 For soup, I like to chop my vegetables roughly, instead of having them all perfect. 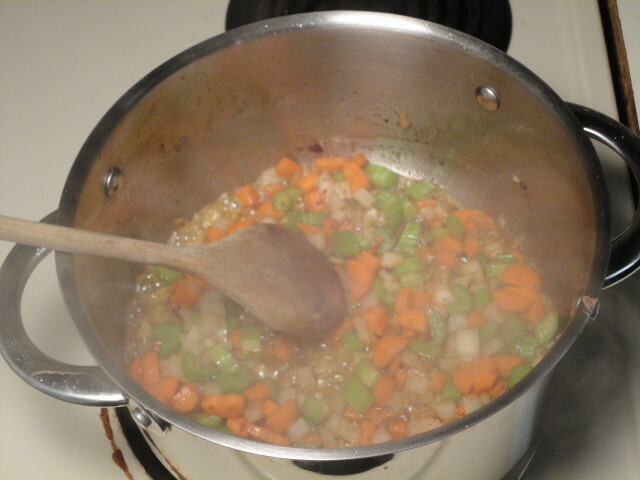 Carrots, celery, and onions are the base of many soups and other recipes, and are also called mirepoix. In Cajun cooking, they are often called “The Holy Trinity”. What was I doing? Oh right, now you’re ready to cook the meatballs. Pour some oil into a pot. I used the same pot I was going to use to cook the soup. It makes for less dishes, and you don’t lose the bits that are left over on the bottom of the pot from cooking the meatballs. 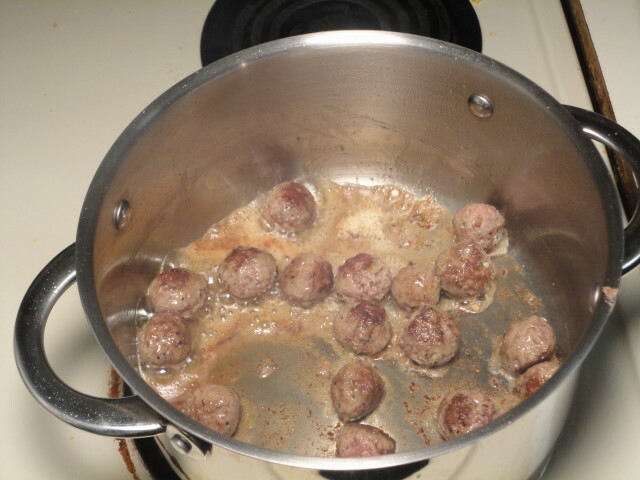 Once the oil has heated up, toss in your meatballs. Meatballs of this size aren’t going to take long to cook, say maybe 6-8 minutes. Keep them moving so they brown all over. When they’re done, don’t eat them! Just set them aside. There are twenty there, I swear. Now, keep your pot on medium heat and toss in the vegetables. 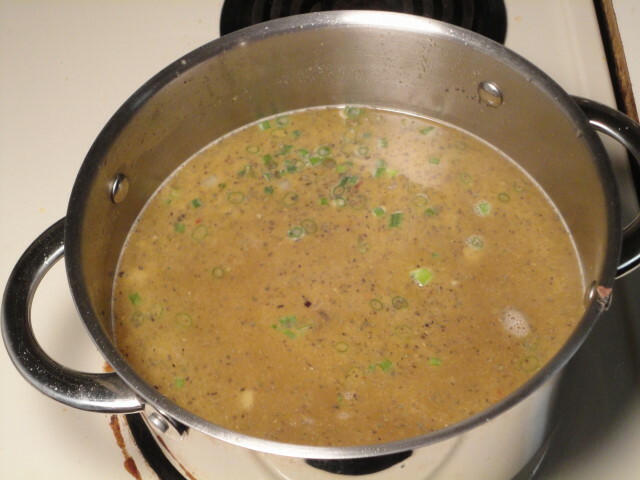 This isn’t a long-simmering soup, so you want to get the veggies well on their way before you add the liquid. You don’t want to brown them, so don’t feel bad about turning down the heat. Once they have softened sufficiently add the stock, water, and everything else..
Bring it a brisk simmer for about 10 minutes. This is just some time for all the ingredients to meet and get to know each other. You can certainly simmer it longer, but I’d hold back the pasta in that case. It would get pretty mushy. After the simmer, you’ve got soup! I put some grated mozzarella on top because that’s what I had, but that probably wouldn’t be the best choice. It just gets stringy and weird. Maybe some fresh-grated Parmesan or just a hunk of crusty bread (yes, with butter) would do the trick. Mom here! Being a bachelor and all, can I assume that your recipes are for one person? Just a thought that came to me! Maybe you want to mention that in your remarks! Love what you’re doing! No actually, they’re normal recipes. Or possibly for one person with the appetite of 4 or 5. This soup looks fantastic! I really like that it doesn’t take forever to cook. Thanks! Usually I prefer soup to be simmered as long as possible, but when I made this I just wanted to eat already.